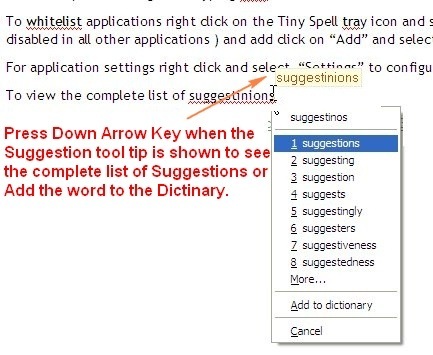 Spellcheck is defiantly an important step before saving or sending a document over as email or printing, but instead of doing a spell after finishing compiling a document, here’s how to do a spell check on the fly as you type. 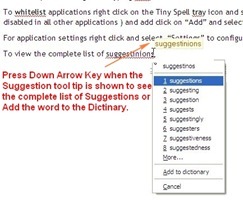 TinySpell Checker is a small little intelligent app that checks what your typing for errors on the fly and suggest corrections as tooltips.It can be customized to spell check only in user defined whitlist applications like MS Word etc., so that it does not start spell checking while typing url’s in browsers etc. To whitelist applications right click on the Tiny Spell tray icon and select “Applications” and next select “Enabled” ( and disabled in all other applications ) and add click on “Add” and select the application. For application settings right click and select “Settings” to configure settings like Beep Sound, Spelling Tip and Hot Keys. To view the complete list of suggestions press “Down Arrow Key” to see complete list of suggestions and to ignore the suggestion press the “Esc” key. To add a word to the dictionary just select “add to dictionary” from full list of suggestions as explained above. The application is a portable app. and is compatible with Windows OS, including Windows 7.